Many people are struggling with recurring sinus problems such as inflammation of the sinuses, sinus congestion, sinus pain, sinus pressure, sinus infection and blocked sinuses. Sinus infection can be treated with the variety of home remedies. In this article we will provide several effective sinus home remedies. But, before that, we will take a brief look at what actually is a sinus infection. 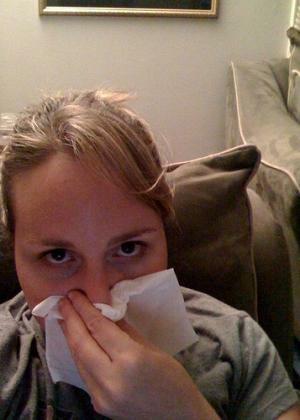 Sinus infection, also known as sinusitis, is an inflammation of the sinuses due to an infection caused by some pathogen. The sinuses are hollow air-filled cavities in the skull located in the space between the nostrils and the nasal passage. Infection of the sinuses is triggered by the inflammation of the nasal passage that can be due to viral infection or allergens and pollutants. As a result of blocked nasal passage, bacteria normally present in the nasal passage begin to multiply and attack the lining of the sinuses resulting in sinus infection. Sinus infection is followed by pain and discomfort, nasal congestion, difficulty breathing, headache, fever and discharge from the nose. This is the old folk remedy for sinus infection. You can mix 1-2 teaspoons of apple cider vinegar with a glass of warm water and drink it two or three times a day for up to three days. You will notice instant relief of sinus pressure. This is an effective remedy for ear infection too. If you suffer from chronic sinus problems, you can drink diluted apple cider vinegar for several months. You can also inhale the vinegar to clear sinus passages. It is recommended to use organic and unfiltered apple cider vinegar. You can apply hot compresses to the sinuses in order to stimulate mucus drainage. To relieve sinus pressure and sinus congestion you can try hot steam inhalation. You can simply put a towel over your head as you breathe in the steam from a bowl of hot water. Also, you can add few drops of some aromatic oil (eucalyptus oil would be the best) to hot water. Inhale the steam for about 10 minutes, couple of times a day. Garlic is another excellent remedy for sinusitis because of its anti-bacterial and anti-fungal qualities. You can drink garlic juice, take garlic capsules or inhale the steam of hot water and chopped fresh garlic. Drinking plenty of water will efficiently help in treatment of sinus infection. This promotes sinus drainage and stimulates the immune system. You should drink 10 glasses of water per day. Also, warm soups with garlic are good for sinus headache relief. How to clear something stuck in throat.